A Northrop Grumman Pegasus XL rocket topped by NASA's Ionospheric Connection Explorer (ICON) satellite takes to the skies beneath a carrier aircraft on June 6, 2018. The plane lifted off from California's Vandenberg Air Force Base on its way to Kwajalein Atoll in the Marshall Islands for a planned June 14 liftoff. But an issue with the Pegasus forced mission team members to send the plane back to Vandenberg, NASA officials announced on June 8. A NASA satellite designed to study the region where space weather and Earth weather meet won't launch this week after all. 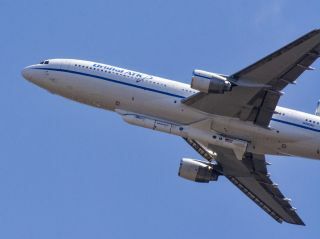 An airplane carrying NASA's Ionospheric Connection Explorer (ICON) spacecraft and its Northrop Grumman Pegasus rocket took off last Wednesday (June 6) on a two-day "ferry flight" from California to Kwajalein Atoll in the Marshall Islands, ahead of a planned June 14 launch. But the plane was routed back to the mainland after Northrop Grumman spotted an issue with the Pegasus, NASA officials announced Friday (June 8). "During a ferry transit, Northrop Grumman saw off-nominal data from the Pegasus rocket," NASA officials wrote in a statement. "While ICON remains healthy, the mission will return to Vandenberg Air Force Base in California for rocket testing and data analysis. A new launch date will be determined at a later date." ICON and the Pegasus were attached to the belly of the plane. This is a normal configuration for Pegasus, which launches in midair after being dropped from a carrier aircraft. This is the second major launch delay for NASA's ICON mission. The satellite was initially scheduled to launch in December 2017, but space agency officials delayed the launch last November to allow more time for rocket checks. Whenever the satellite reaches orbit, ICON will study the ionosphere, the dynamic region of Earth's atmosphere that stretches from about 30 miles to 600 miles (48 to 965 kilometers) above the planet. Radio and GPS signals travel through the ionosphere, so conditions up there can have a big impact on everyday life down here. An artist's view of NASA's Ionospheric Connection Explorer, or ICON, satellite. NASA has delayed the ICON satellite's planned June 14 launch due to rocket issues. "To understand what drives variability in the ionosphere requires a careful look at a complicated system that is driven by both terrestrial and space weather," NASA officials wrote in a mission description. "ICON will help determine the physics of our space environment and pave the way for mitigating its effects on our technology, communications systems and society." Virginia-based company Orbital ATK developed the Pegasus. The ICON launch was scheduled to be the rocket's first mission after Orbital's recent acquisition by Northrop Grumman. Orbital ATK is now known as Northrop Grumman Innovation Systems.